KANSAS CITY, Mo. 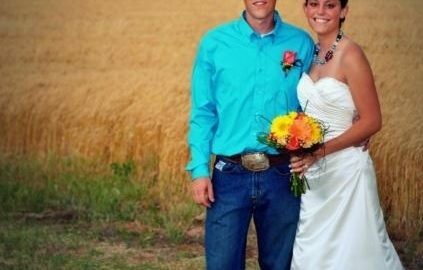 (AP) — In the plains of central Kansas, tornadoes are so unremarkable that wedding guests barely flinched as a barrel-racing bride wed her bull-riding groom with a twister dropping from the sky just miles away. But for people living outside Tornado Alley, Caleb and Candra Pence’s wedding last Saturday is generating the kind of buzz usually reserved for celebrity nuptials. The video of the service has gone viral, garnering more than 20,000 views on YouTube and a flurry of media coverage. “It is amazing how fast it has taken off,” said the groom’s uncle, Lee Pence, who shot the video. After Saturday’s outdoor service on the groom’s family farm near the small south-central Kansas town of Harper, the couple posed for photos with the twister visible behind them. The pictures capture them smiling serenely — the 21-year-old bride in a white gown and the 22-year-old groom in a cowboy hat and jeans. About eight to 10 miles away, the twister was damaging a farm and wind turbines. The National Weather Service has classified it as an EF-3 storm, packing winds of 138 to 167 miles per hour. “I don’t know how on earth I will ever top this,” said wedding photographer Cate Eighmey, who said she posed the pair for dramatic shots of the newlyweds and the twister behind them. Eighmey’s photo shows what appears to be a second funnel dropping down from the cloud. The couple has spent their honeymoon in Wyoming fielding media calls. Reached on his cellphone by The Associated Press, Caleb Pence recalled seeing the wall cloud forming as the service was about to begin. But with tornadoes a routine occurrence, the storm was the least of his worries. “I had my mind on marrying my now wife,” said Caleb Pence. Some of the guests who filled the 250 folding chairs checked weather reports on their cellphones. But otherwise, the 20-minute service — complete with a solo singing performance — wasn’t altered. Afterward, the couple, who met at a rodeo, made a dramatic horseback ride to the metal farm building that had been transformed into the reception site. They scarcely got inside when the skies opened up and poured down rain. The party didn’t end until after midnight.